Stay right in the Canyon Racquet Club community when you choose this luxurious four-bedroom vacation condo for your Beehive State getaway. You'll have gorgeous hardwood floors, WiFi, and more, as well as a hard to beat location just southeast of downtown. 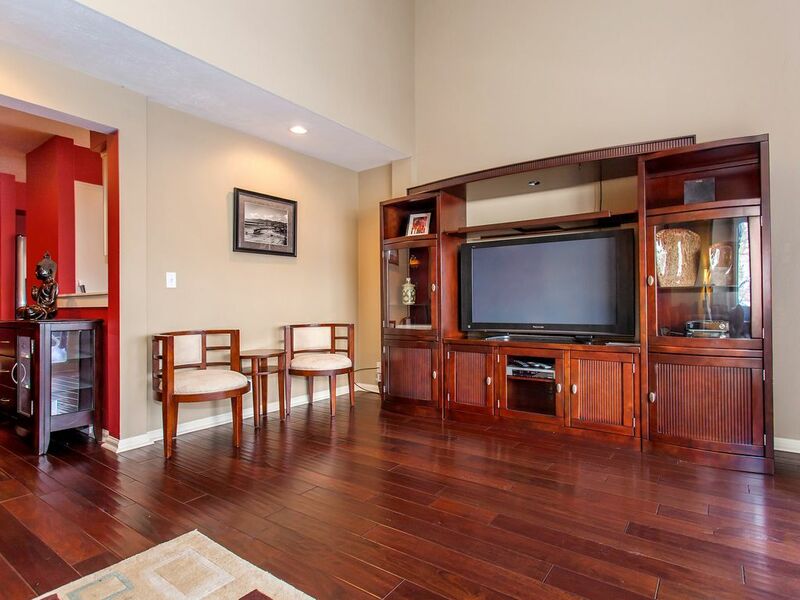 Situated at the base of Big Cottonwood Canyon, this Canyon Racquet Club Condo is just 20 minutes from the heart of Salt lake City and its shops, galleries, restaurants, and cultural attractions. And while you'll be a bit from all of the city's hustle and bustle, four world-class ski resorts are within a 15-minute drive. With tall, slanted ceilings, designer colors, and a bright and open floor plan, this Salt Lake City condo will welcome you home after the day's adventures. Entertainment includes cable and a large flatscreen TV, a DVD player, and a stereo with a CD player. Of course, you may just want to stay unplugged and curl up in front of the fireplace with a good book or go for a luxurious soak in the private hot tub. The kitchen pops with bright red walls and white cabinets and contains all of the major appliances you'll need for home-cooked meals. If you do want to venture out for sustenance, you'll find a few restaurants and eateries within walking distance if you don't feel like making the drive to all the way to SLC. At night, four spacious bedrooms are available to your group of up to 10. A master bedroom with a king bed, two bedrooms with queens, and one with four twin-size beds provides spots for everyone to get a good night's sleep. This elegant condo is great for families or couples traveling with kids. It's close enough to the city for easy back-and-forth, but away from all the noise. And if you came to Utah to ski at the Alta Ski Resort in the winter (or one of three others right nearby) - it would be hard to find a better homebase! Come explore Northern Utah and stay at this gorgeous and stylish Salt Lake City vacation condo for amazing skiing, great amenities, and year-round adventures. The location for skiing man areas is great. Kit was super helpful. Thanks for everything. We loved the place. Nice house, well-situated to get to both Canyon's ski resorts. We rented this house for our yearly ski trip (all adults), and it provided great access to both Canyons, which was key for us as we were skiing different resorts in each canyon. The house was comfortable, clean, and in good condition. The hot tub was also great after skiing. One room has 4 bunks (two separate bunk beds), so it was not as ideal for 7 adults to share, but the beds were all comfortable and it would be great for kids. A nice place with great access to ski resorts. The unit is very well maintained and nicely decorated. The beds are comfortable and there is a lot of room. Best part for us was the quick access to the roads leading up to the ski resorts. It is only about a block away from the entry to Big Cottonwood Canyon and a short ride to the entry to Little Cottonwood. Loved the place and the location!